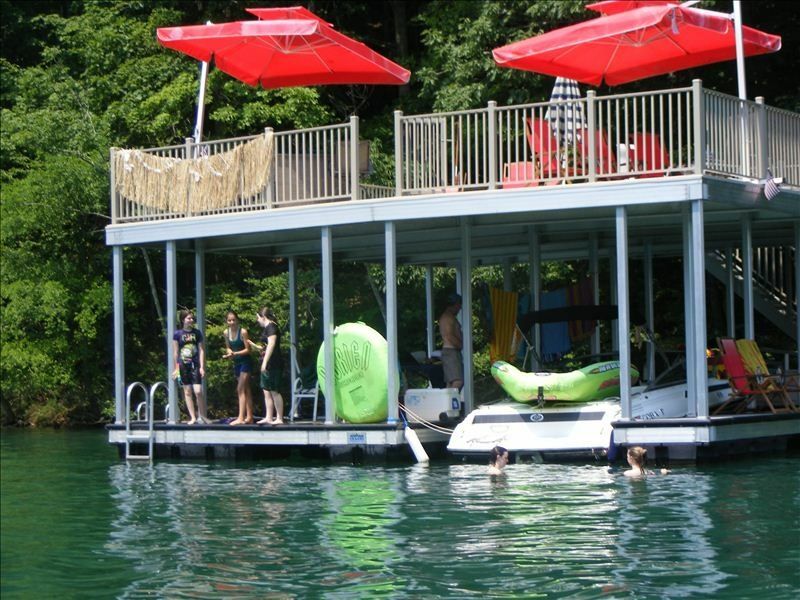 Feel like you are in a 'tree house'...yet have a private double deck dock in a private cove! Whether you are a house-boater, skier, fisherman, sightseer, sunbather, or water sports lover, Norris Lake has it all. Norris Lake was created by the construction of the Norris Dam in 1936. This hydroelectric project was the Tennessee Valley Authority’s first. The lake’s beautiful blue-green waters span more than 800 miles of shoreline covering 34,000 acres. Norris’ boundaries extend up the Clinch and Powell rivers which feed Norris with clear, pristine waters. It’s an ideal environment for sportsmen and vacationers alike. This home is situated in a beautiful cove on Lake Norris. It has 2 bedrooms and the basement is a bunk area/game room. The upstairs has a king size bed in one of the rooms and the other room has a queen size bed, one full bathroom with shower/and tub , separate private hot tub house, porch, stairs to the dock, basement area with couches/queen bed, 1 single bed with trundle single under both the beds in the basement bunk area. There is high speed internet and TV's both upstairs and in the bunk room. Washer and Dryer are downstairs. Enjoy the beautiful wildlife, private setting, swimming, boat slip, jet ski slip, lots of lounge chairs, fishing.... all you need to relax and 'get away' from it all! Please be aware that there are 250 +/- steps from the cabin to the dock (and back up again!!). Well worth the effort to get there and back, but we like to be sure our customers know this before committing to the rental. Closest marinas by car are Whitman Hollow Marina and Indian River Marina, and by boat--Sequoyah Marina is closest. Boat rentals are available at all three of these marinas. Owners: Chuck and Reecy French. We live in Knoxville, TN and own and operate a Management Consulting firm called Payne-French Assoc. We rent furnished rentals in Knoxville, TN and Nashville, TN. We also build homes in Tellico Village. You can learn more about Tellico Village as a retirement area on the tellicovillage website. We bought this lake house because Lake Norris is the most beautiful lake in the WORLD! We also bought it so that we could create and cultivate wonderful memories with our children, family, extended family, and friends! The waters are the most beautiful boating waters around! The marina's are so clean and well equipped. The trees are stunning around the fresh clear water on Norris Lake. Our family memories continue to grow at this wonderful home on the lake. Full bathroom with combined tub/shower. House has winter-time view of the lake --- but much higher than where the double deck dock is situated. Fantastic view and access to the lake from the dock. Property is lakefront. Double deck dock in private cove. The house is situated up the stairs from the dock. Be aware there are a lot of stairs between the home and the dock. 250 +/- stairs. Bath towels only. TOWELS ARE NOT TO LEAVE THE HOUSE. Comcast digital cable TV provided. In separate cedar building on property. Private double decker Dock on year-round deep water Cove. Dock has a 10 x 26 covered boat slip, and a 10 x 10 jet ski bay. Covered deck/swim platform on lower deck. Open upper deck is 30' x 30'. Sunchairs, barstools, umbrellas provided on dock. You can use this home as a 'hub' for multiple houseboats. Use the dock to cater events! BBQ ribs on the dock! Grill on the dock-- we have also rented several houseboats and used the house, and the dock for the perfect family reunion. Ask us how and we will help you coordinate such an event! From getting the houseboats to the cove ...to provisioning them.